Today I finished my final square. Phew! Only just ahead of you all….this spontaneous CAL has been a lot of fun and has kept me busy over the Christmas season. It is lovely to be able to say I made a blanket in this short time. Round 3: ss into 2ch-sp, 5ch (counts as 1tr, 2ch), 2tr into the same 2ch-sp, 1tr into each tr and 1ch-sp along each side and (2tr, 2ch, 2tr) in each 2ch-sp on the corners, finish with 1tr in the first 2ch-sp and join to 3rd ch from start with a ss. You should have 11tr along each side and 2ch in each corner of your motif. Round 4: ss into 2ch-sp, 5ch (counts as 1tr, 2ch), 2tr into the same 2ch-sp, 1tr into each tr along each side and (2tr, 2ch, 2tr) in each 2ch-sp on the corner, finish with 1tr in the first 2ch-sp and join to 3rd ch from start with a ss. 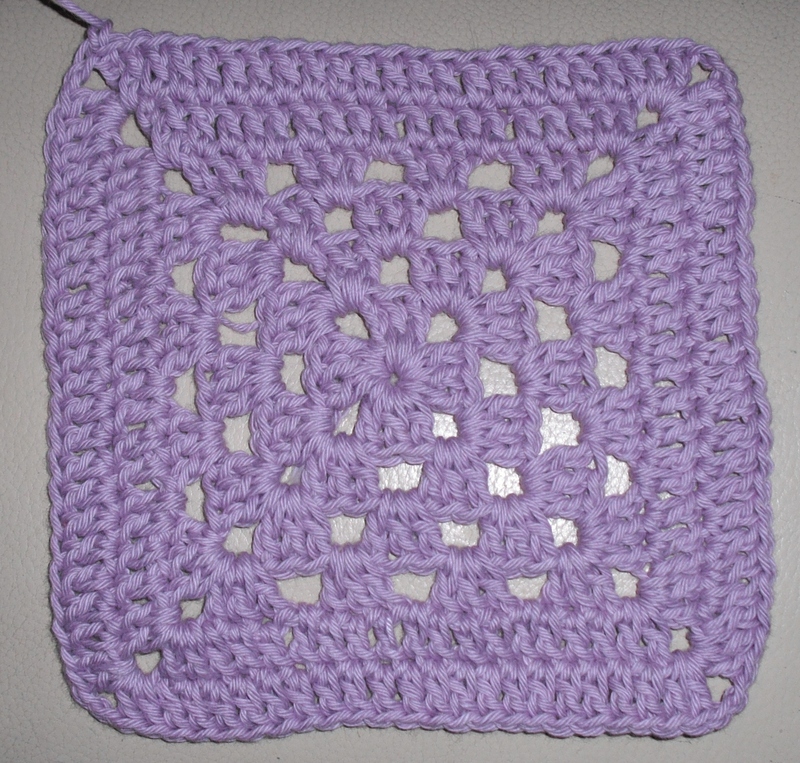 You should have 15tr along each side and 2ch in each corner of your motif. Rounds 5 and 6: Repeat Round 4. You should have 23tr along each side and 2ch in each corner of your motif. Break yarn and fasten off leaving a long tail about 3m long for sewing or crocheting together later. Round 3: ss into 2ch-sp, 5ch (counts as 1tr, 2ch), (3tr, 1ch) into the same 2ch-sp, *(3tr, 1ch) into the next 1ch-sp, (3tr, 2ch, 3tr, 1ch) into the next 2ch-sp; repeat from * another 2 times (3tr, 1ch) into the next 1ch-sp, 2tr into the first 2ch-sp, join to 3rd st of starting 5ch with a ss. Round 4: ss into 2ch-sp, 5ch (counts as 1tr, 2ch), (3tr, 1ch) into the same 2ch-sp, *(3tr, 1ch) into each of the next two 1ch-sps, (3tr, 2ch, 3tr, 1ch) into the next 2ch-sp; repeat from * another 2 times (3tr, 1ch) into each of the next two 1ch-sps, 2tr in the first 2ch-sp, join to 3rd st of starting 5ch with a ss. Round 5: ss into 2ch-sp, 5ch (counts as 1tr, 2ch), 2tr into the same 2ch-sp, 1tr into each tr and 1ch-sp along each side and (2tr, 2ch, 2tr) in each 2ch-sp on the corners, finish with 1tr in the first 2ch-sp and join to 3rd ch from start with a ss. 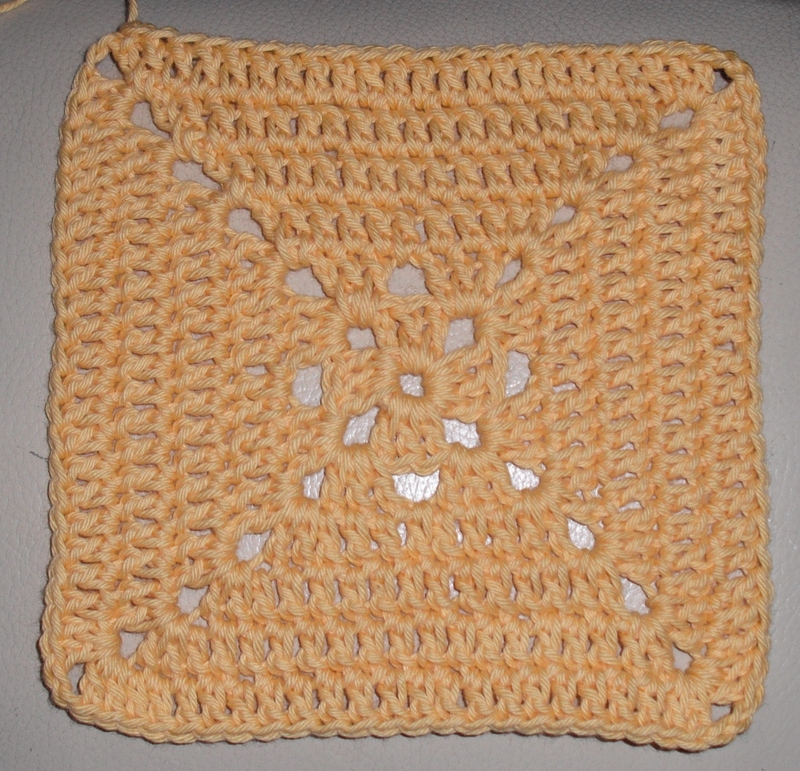 You should have 19tr along each side and 2ch in each corner of your motif. Round 6: ss into 2ch-sp, 5ch (counts as 1tr, 2ch), 2tr into the same 2ch-sp, 1tr into each tr along each side and (2tr, 2ch, 2tr) in each 2ch-sp on the corner, finish with 1tr in the first 2ch-sp and join to 3rd ch from start with a ss. You should have 23tr along each side and 2ch in each corner of your motif. Break yarn and fasten off leaving a long tail about 3m long for sewing or crocheting together later. My mind is now turning to edging but first I need to join them all. I don’t have a lot of yarn left, in fact I have to confess now that I didn’t have a full 2 balls of each colour and I knew I might be a little short of yarn at the end. But you should have taken my advice and made sure you have at least a full 2 balls of each colour (or 2 x 184m/201yds), so you should have plenty left. I do want a simple edging and I know I have just enough for that, but you may want to do something more fancy and I know you’ll have enough yarn left to experiment. Tomorrow I’ll share layout ideas and how to join.